I am an award-winning Custom Call Maker from the State of Wisconsin. I am a Diamond Life Sponsor of the National Wild Turkey Federation, a Wisconsin State N.W.T.F. Board member and I am an active member of The Wisconsin Bow Hunters Assoc., Ducks Unlimited, and Wings over Wisconsin. I live by a strong conservation ethic. I defend our right to hunt, and I support our Armed Forces. 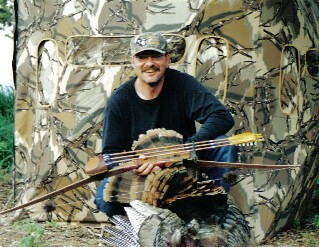 My main passion is Turkey hunting and calling in those birds with the calls that I make. I have been commissioned by many local and national N.W.T.F. chapters, numerous charities, and U.S. Armed Forces to build calls for morale and monetary support. I am proud of the calls I build, and their ability to entice and locate Gobblers. I also became a dealer for Double Bull Archery after hunting out of one of their blinds on a South Dakota hunt. I truly believe in them. They hold well in any conditions. So check out what I have to offer on the next couple of pages, and be sure to check out other hunters, from across the country, on the gallery page with the pictures of their success.